Imagine beginning your new career in Patent Law. If you're already an engineer or scientist or have a degree in one of these fields, chances are good you may begin your career in Patent Law right after you pass the Patent Bar Exam. Upon passing this exam, you'll be classified as a Patent Agent. And if, in addition to your degree in engineering or science, you've also completed the requirements to practice law, then you may be eligible to become a Patent Attorney. A career in Patent Law will position you directly on the cutting edge of technology. It's quite a prestigious field and one of the hottest legal areas around (which typically pays higher wages than most other legal fields). Learn more about our Patent Bar Review Program, created especially for those interested in passing the Patent Bar Exam quickly and easily. Basic Patent Training Course covering the fundamentals of Patent Law in 9 modules along with easy quiz questions to make sure you're learning and retaining the material. Plus there's a glossary with over 250 patent law terms completely defined in easy to understand language. Guidebooks to Patent Law delve into every chapter of the MPEP (Manual of Patent Examining Procedure). Summaries, key points, at a glance tables, and outline format make reading through the complex material much easier. There's also a condensed Hot Topics section when you reach crunch-time. Workbook quizzes for each and every chapter consisting of short summary, fill-in-the-blank, and true/false questions test your retention. 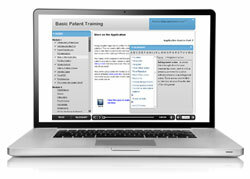 PatExam Engine testing application allows you to review practice exam questions over and over again. There's a topic review of over 40 tested topics that allows you to hone in on your weak areas. And there's also a timed, simulated test exam environment. All your scores are tracked in the tracking center. Everything is completely updated for the currently tested version of the MPEP plus the America Invents Act (AIA). It has all been written and edited by registered patent practitioners so you can rest assured the people behind this course have actually taken the exam and immersed themselves in this material. You will also receive a 12-part customizable lesson plan. If you complete one lesson each week, you will be prepared in about 12 weeks. And you will receive access to the Patent Law Career Toolkit to help you find a job, create a winning resume, prepare for interviews and develop a full career plan. Find out exactly who qualifies to sit for the Patent Bar Exam. The two most common ways to qualify are based on the degree you received or on your college coursework. The USPTO may also take a look at any relevant experience you possess. The main point is that you must have a technical background that will allow you to help an inventor file and prosecute a patent application. Learn a little about a career as a patent agent or attorney. Find out where you can gain employment. Patent practitioners often work in technology-based corporations, universities, and legal offices.